When you are thinking about installing engineered hardwood in your home, turn to the experts. Our store not only carries a large selection of wood flooring, but our knowledgeable staff is also available to help you find the ideal product for your home. Whether you are interested in hand scraped, reclaimed, or solid hardwood flooring, we have many beautiful options. If you need a durable wood floor for your basement or a heavy traffic area in your home, you should take a look at engineered hardwood. Because basement flooring is more likely to come in contact with moisture, engineered wood products are the perfect solution. While you can install other wood flooring products on a concrete subfloor, it involves more work and costs a little more. Back in the old days, wood floors were installed with wood planks that had been individually scraped with handheld tools. This technique created a truly one-of-a-kind appearance that included natural imperfections in the wood, as well as flaws resulting from the scraping process. Some craftsmen even marked the boards with hammers and chisels to give the floor a distinct look. 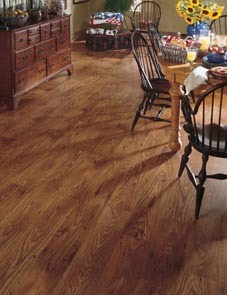 With hand scraped hardwood, many of the scratches and dings that come from normal wear and tear are easily camouflaged. This type of wood flooring is ideal for active households with children and pets. With the many stains and finishes on the market, you are able to make this wood fit any room. Make a unique statement with reclaimed hardwood flooring. This option is not only environmentally friendly, but it is also a great way to maintain the period look in your historic home. The age and character of this type of flooring are unique and stylish. Plus, this material cannot be recreated because most of these old-growth wood species are no longer available. Give your home a rich, sophisticated look with beautiful solid hardwood flooring. This flooring material is not only long lasting, but it can also be refinished many times. Installation tends to be straightforward. In addition, the thick boards are hard and durable. Add beautiful hardwood flooring to your home! Contact us in Brookfield, Waterville, Waukesha, Richfield, and Grafton, Wisconsin.